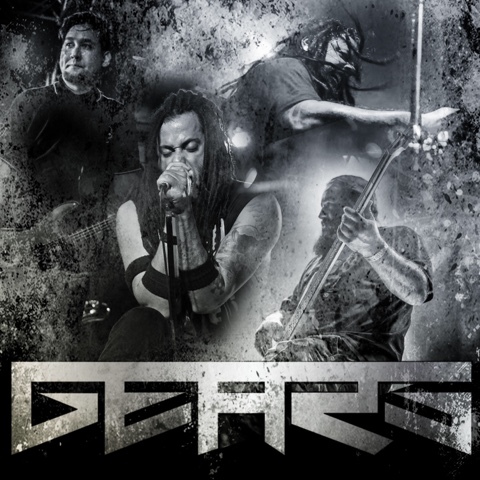 Miami based hard/heavy rock act GEARS isn’t your everyday garage band. Despite being faced with a multitude of challenges right from the start, the band has persevered and is growing stronger than ever. Founded in February 2014, Trip 6 (Urban Rebel), Eli Parker (Endo), Tommy Herres (SCARLET CARSON), and Jimmy Wooten (SKINMASK) were all looking for new projects resulting in the birth of GEARS. 1. How did you guys end up getting together and forming Gears? ​Trip and I put the band together in 2014 with two other guys who actually have come and gone. We were all in different bands that had kind of run their course so we were looking to do something new. We all got together in February of 2014 in Miami and started writing. What came out was the Set in Motion EP (May 2014). After a busy year of touring, we were ready to start work on the new EP. We had some member changes at that time so Trip and I did the record with our Producer, Corey Lowery (Saint Asonia, Eye Empire, Dark New Day) and friend Troy McLawhorn (Evanescence, Seether, Dark New Day). “Pride Comes Before the Fall” was the result. 2. You released your new EP "pride comes before the fall" in November, Can you tell us a little bit about it for those who haven't heard it yet and what it was like creating it? ​It’s definitely an evolution of the band from the first EP. “Pride” still has that heavy edge, but I feel like it’s more musical. The writing definitely has taken steps forward for us. The actual process making the record was really relaxed and organic. We wrote the record with Corey who had produced the first EP, but this time, it was just us three for the writing process. I feel like it was a lot more focused. We have known each other for a long time and I have all the trust in the world in Corey’s experience and ear. He’s a pleasure to work with. Super laid back and focused. 3. What bands, do you believe have influenced your sound the most? I know that we all have a lot of different influences. That’s always a hard question to answer. We draw inspiration from a bunch of different places. Zeppelin, Bowie, Deftones, Alice in Chains, etc. There really are too many for me to really narrow it down. ​I think our greatest accomplishment has been just to be out there doing it ourselves without a huge budget. We work really hard and try to do as much as we can as far as putting out a quality product and supporting it on as many tour dates as possible. It’s tough in today’s industry to be DIY and trying to build a band from the ground up. Each one of us is very focused though. We all want to achieve the same goals and I think that’s the most important thing. 5. How have you overcome that challenge? ​Everyday in the life of a DIY band is a challenge. We have put together a great team over the past year that helps us fight for exposure and to achieve success. So, I think that in itself is an achievement. lyric video for their track "Face Down" from their new EP "Pride Comes Before The Fall" which is available now on iTunes.